Leather Car Seats: you're not asking the right questions! 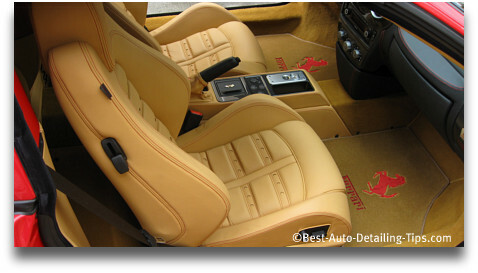 As a professional auto detailer, the topic of leather car seats comes up very frequently from people concerned with proper care and maintenance of their leather car upholstery. From this page you will be able to educate yourself on all things relating to this natural material and its different uses within cars, trucks, and even RV's. Much bad information and misleading advertising has left many people with unanswered questions and inappropriate strategies of automotive leather care. Considering the rise in leather appointed interiors, it is no wonder it is the number one question I am asked with regards to the care of car interiors. What can I use to clean my car leather? What is the proper way to clean leather? Does my car leather really need conditioning? There always exists a natural order to things. As people, we often ignore this universal law due to laziness or impatience; we have been groomed as society for instant gratification. It is always best to start with the basics, then build upon these basics. For it is said that the bigger, wider, stronger your foundation, the higher you can go. As one of the critical key objectives of this website, simplifying the many areas of cosmetic car care and auto detailing is the laying of a solid foundation of understanding, which of course means starting with the basics and then building upon these basics based on you and your motivation for continued learning. 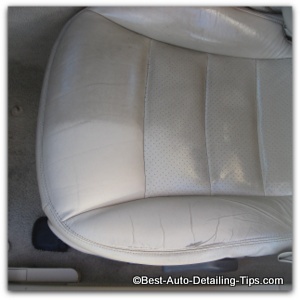 Car Leather Care -Your first step to understanding the basics of automotive leathers. Learn how modern advances in the manufacturing of car leather interiors has completely transformed the car leathers of today, from the car leathers of yesterday. Learn the difference between the various types of leathers: aniline, semi-aniline, and corrected grain leathers. Learn why knowing and understanding the "nature of the beast" is your first step towards the proper care of your car's leather upholstery. As consumers, we have been lead to believe that automotive leather is this delicate and sensitive natural material that requires specialized attention. Because leather goods exist in countless areas of life in countless industry's, we often lump all forms of leather into a single category. The reality is that automotive leather is a different "animal" than many of the other leather goods that permeate every area of life. The problem is that this has been over-exaggerated to the point were we have been disabled as consumers. Add to this the over-saturation of car leather cleaners, treatments, and conditioners. 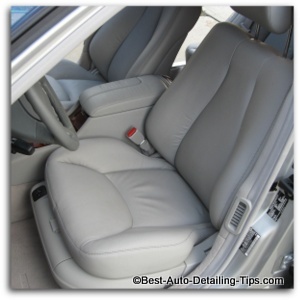 Clean auto leather seats -Your car leather has become dirty and its time for some leather cleaning. This is your place to learn both the proper and professional techniques along with actual products. 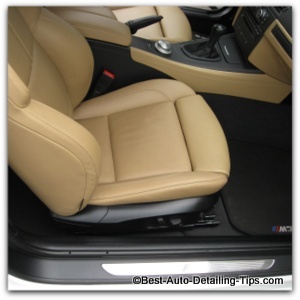 Does finding the "right" leather cleaner really matter, or all car leather cleaners the same? What leather cleaner do I use professionally to deliver professional results to my own customers? What is the technique for proper automotive leather cleaning and what sort of tools are required and recommended. Life happens for most of us and the reality is that much of our life is filled with good intentions. Except good intentions won't get you leather car seats that are clean. So for many of us the years slip away almost unnoticed and the next thing you know the leather in our car's look painfully dirty. Heavy Duty Car Leather Cleaning- Do you fell like you need to shower after taking a drive in your car because your car leather is so dirty. 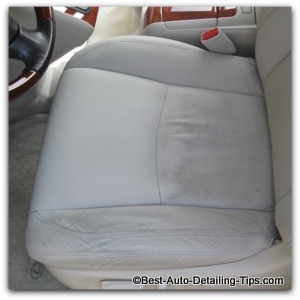 See how to deep clean the car leather and restore some dignity back into the leather. See what I recommend for excessive dirt build-up on your car's leather upholstery. See my video that will guide you through the actual process. Not only is the topic of leather conditioners and dressings full of bad information being endlessly supplied by well-intentioned but misinformed people, but the industry itself does much to keep consumers just like yourself in the dark. As car owners and enthusiasts alike, we are stuck in outdated information, utilizing outdated methods to clean and maintain our leather car seats. Add to all of this is the fact that most people over-look the much more critical part of car leather cleaning, and jump straight into their quest to find the best car leather conditioner. Auto Leather Conditioner -Do you search for the best the industry has to offer when it comes to leather conditioners for your leather car seats, or do you become an informed consumer first? Learn my insider tips regarding the use of leather conditioners. Learn the actual products I use and recommend if you decide leather conditioning is right for you and your car. Learn how using leather conditioners can actually become counter-productive. Learn some additional tips and tricks I use when cleaning black or dark colored leather in the form of an aerosol spray dressing/conditioner. Pay Leather Car Seats Forward! I hope the links I have provided for you on this page not only help you get more of what you are trying to get, but also help you become part of the minority of today's world known as "the informed".